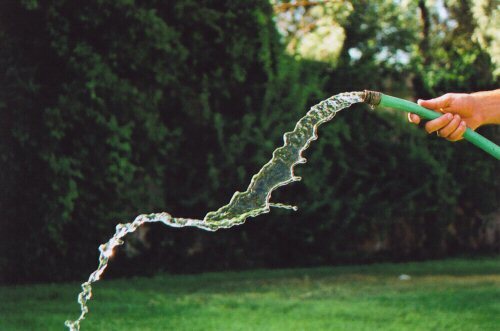 Home » Drop the Garden Hose…. it’s for your own good! I know how tempting it is for many homeowners to grab a garden hose and spray their windows when they want a quick cleaning. However, what a lot of homeowners don’t realize is that the water coming out of the tap is far from pure. Sure it may be safe to drink but that doesn’t mean it’s pure 100% water. Regular tap water (and even that expensive bottled water from Swiss mountain streams) contains dissolved minerals, the most common being sodium, calcium, magnesium, and potassium. Having minerals in your water is good for drinking but bad for your windows. It is especially bad on a hot sunny day where the garden hose spray dries almost instantly and bakes the minerals onto the glass. If this happens repeatedly the minerals can actually etch the glass and cause permanent damage. 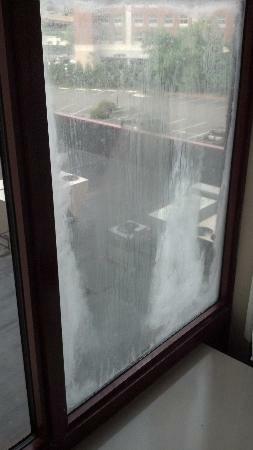 Spraying your windows can cause even more damage than just hard water stains. Did you know that your garden hose has enough pressure to permanently damage your window seals? Its true. If you put the hose on a “jet” setting and send a concentrated stream of high pressured water cascading against your window glass, it can deflect into the edges and blow your window seal. You won’t notice it at first, the fogging is not instantaneous. But, in a couple of weeks moisture can start to condense inside the panes, The window will take on a foggy look and will need to be replaced if you want it to look new again. This is why you need to be very careful when selecting a company to pressure wash your home. You need to instruct them to stay away from your windows. Tell them that they don’t need to spray your windows. It is always better to have the pressure washers come first and leave the windows alone, then have the professional window cleaners come and clean up any mess that drips onto the windows. You may save a lot of money in window replacement costs.